KANSAS CITY (PAI)– President Obama should reverse U.S. policies in Honduras that forced unaccompanied minors to flee from that Central American nation to the U.S., a labor journalist who heads a network promoting cross-border relations says. In a recent op-ed piece in the Kansas City Star, Judy Ancel, a member of the International Labor Communications Association (ILCA) and host of a pro-worker labor radio program in Kansas City, adds her trips to Honduras shows the “carnage” in that nation since the U.S. stood by during a 2009 coup. The coup led to more multinational corporate exploitation of Honduras, a sharp increase in poverty and the world’s highest murder rate, among other ills, she said. The U.S. could start to right things by withdrawing its political and military support for Honduras’ current president, Ancel adds. Ancel wrote her op-ed after Obama went to Texas to discuss the unaccompanied minors problem with right wing GOP Gov. Rick Perry. 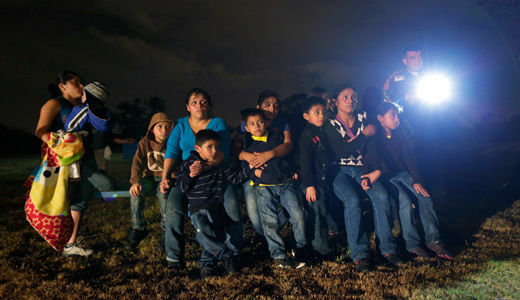 Obama did not visit the Texas-Mexico border, which has seen more than 50,000 unaccompanied minors from Guatemala, Honduras and El Salvador cross in recent months, fleeing violence in the three nations and seeking reunification with family members in the U.S.
Republicans bombarded Obama with criticism for not visiting the border, and for not supporting repeal of a 2008 law, passed with overwhelming bipartisan support, offering a form of asylum to the kids while placing them with families and awaiting status hearings. Perry called up 1,000 Texas National Guard members and sent them to the border, while criticizing Obama for failing to send troops there. And the GOP is pushing repeal of the 2008 law and virtual immediate deportation of the kids. Over the screams of some congressional Democrats, Obama has said he’d be willing to discuss amending the law. Ancel, who has taken three trips to Honduras since the 2009 coup in her capacity as president of the Cross-Border Network for Justice and Solidarity, calls both Obama and the GOP wrong. Obama’s “solution is to ‘humanely’ deport the kids back to the disaster areas from whence they came… They are not the cause of this mess; they’re its victims,” Ancel says. Neither Obama nor the GOP “ask why the kids come,” she notes. Instead she faults Obama for “smugly blaming” their parents for putting the kids in harm’s way. “Does he really think these children would come if they weren’t already in harm’s way?” she asks. “And our failed drug war has militarized communities and thrown them into chaos. We have imposed so-called free trade and free markets on the region, breaking the back of small businesses and its rural economy. The crisis at the border is in fact blowback from these policies, and the children are refugees,” she says. Of the more than 50,000 refugee children, 29 percent come from Honduras, Ancel notes. Honduran poverty rose by 13 percent since the 2009 coup, and extreme poverty rose at double that rate. Poverty was declining under ousted President Manuel Zelaya, she said. Zelaya also raised the minimum wage, offered free education and tried to create jobs, she added. He was making Honduras “into a democracy instead of a breeding ground for forced migration” of the kids’ parents. “The administrations of Pepe Lobo, who replaced Zelaya, and Juan Orlando, the current president, have welcomed in multinational corporations and together with them are evicting farm families from their little plots of land so they can grow African oil palm. 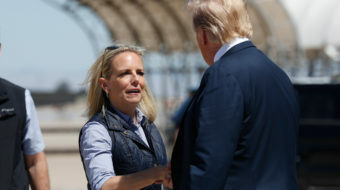 The coup produced an exodus of “Honduran parents” to the U.S., who now take low-wage jobs “so they can send money home to kids they haven’t seen in years,” she says. “Rather than blame them and build more fences, our elected officials should stop playing politics with children’s lives and start fixing the disasters they’ve wrought overseas so people don’t have to migrate. They should protect the children as refugees with Temporary Protected Status while they consider a real immigration reform that would let families unite and live in safety,” Ancel concludes. Teamsters legislative representative Mike Dolan agrees with Ancel. He told a recent radio interviewer the refugees from Honduras and the other Central American nations are “CAFTA kids” referring to the so-called “free trade” pact those nations signed with the U.S. several years ago. “They are actually the second generation of economic refugees to leave their land and their homes. The first wave came after NAFTA took effect on Jan. 1, 1994,” Dolan explained. NAFTA “allowed U.S.-based multinationals like Cargill and ConAgra to impose industrial agriculture on Mexico, undermine wages and drive farmers off the land into barrios, ghettoes and across the U.S. border.” That’s what CAFTA’s doing in Central America, he added. “Teamsters President Jim Hoffa predicted CAFTA would screw workers in the U.S. and in Central America, just as NAFTA did in the U.S. and Mexico. He was right,” Dolan said.